Terminating data is an extremely important measure. We keep it safe. If deleted files end up in the wrong hands, your company could suffer dire circumstances to your security and privacy. Deleting files and moving them to a recycle bin or permanently deleting them does not ensure safety. E-waste protection of your electronic data is our top priority and concern. We care for your cast-offs and follow certain destruction procedures. Mountain View E-Waste is a pro in data destruction and is an active member of the National Association for Information Destruction ensuring complete and absolutely safe data destruction. We comply with the US Department of Defense 522220.22-M. We provide various levels of, and take careful steps in data termination, such as, hard drive shredding and hard drive overwriting, etc. Once done, Mountain View E-Waste provides a completion certificate to the concerned company. This certificate ensures that the company is protected from any threats resulting from terminated electronic data. Mountain View E-Waste possesses a state-of-the-art hard drive shredder that effectively transforms non-recyclable assets to thousands of tiny pieces leading to safe disposal. 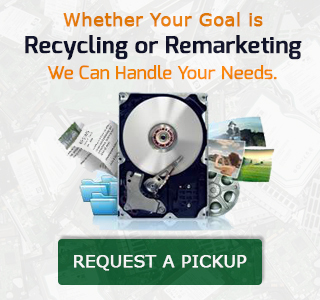 Trust Mountain View E-Waste and you will not find any single remnant of deleted data. We are reliable and care for your safety and security!